MANILA, Philippines - Purefoods Star Hotshots knew that they will have their one foot in the grave if they would lose to Alaska for the second straight time. So as early as the opening minutes of the ballgame, Coach Tim Cone and his boys tried to gain the momentum to atone their heart-breaking loss last Wednesday. Both James Yap, Mark Barroca and Mic Pennisi drained three-pointers for an early Hotshot lead. Alaska play maker JV Casio and Sonny Thoss retaliated to avoid another 1st half meltdown. Despite of Marqus Blakely getting into foul trouble early in the first quarter with 2 personals, Purefoods’ locals still managed to keep their slim margin before the horn sounded. But, Calvin Abueva who came off the bench beat the buzzer with an almost half-court shot for the equalizer, 23-all. “The Beast” felt his hands burning as he continued to drop baskets at the start of the second period. Together with Aces’ second-stringer point guard Fil-Italian Chris Banchero, they hustled and crashed the boards and converted them into goals. The Aces had 22 rebounds against Hotshots’ 12 with more than 8 minutes remaining in the first-half. Just like Blakely, Alaska import Romeo Travis committed his 2nd personal foul and spent majority of the quarter at the bench. Coach Alex Compton sensed that the Hotshots were slowly catching-up so he decided to send Travis back in. The lefty import poured in 3 consecutive mid-range jumpers backed-up by Ping Exciminiano’s two treys for a 6-point, 47-41 lead heading to the dugout. With their astounding game 1 comeback victory, some fans and analysts are now branding the Aces as the new “Never Say Die (NSD)” team of the PBA. Gilas Pilipinas 3.0 Head Coach Tab Baldwin concurred with the pundits’ statement by sharing his thoughts on Alaska’s stunning payback last Wednesday. “You guys are like a bad smell that won’t go away,” a brief text message from Baldwin sent to Aces Assistant Coach Jeffrey Cariaso in admiration to his team’s no quit character. The Aces continued to crash the boards in the third period to keep their distance from the struggling Hotshots. 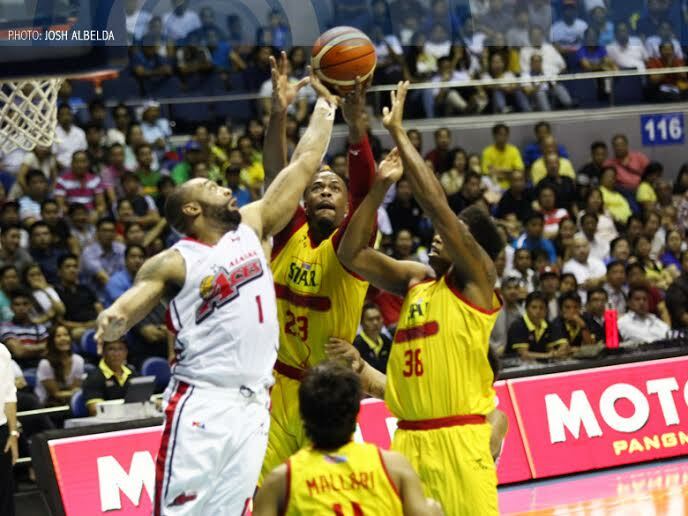 Romeo Travis led his team with 11 rebounds seconded by Calvin Abueva with 6. Abueva cooled down himself on the bench after committing his 4th personal foul for trying to neutralize Marqus Blakely. Seconds after he was sent back to the floor midway of the 3rd, Abueva acquired his 5th personal foul for trying to deny Blakely’s shot underneath the basket. He was immediately pulled out to preserve his last foul for the final quarter. Purefoods focused so much on guarding Travis and totally forgot to defend other unheralded Aces like Noy Baclao who posted 8 points in the dying minutes of the 3rd period to give Alaska 74-58 lead moving on to the final quarter. PJ Simon wanted to emulate Alaska’s comeback win during their last meeting, fired and connected twice from the rainbow country to cut the lead to a single-digit. While the Hotshots were trying to do a potential run, Romeo Travis and 2010 Top draft pick Noy Baclao had their moments and helped their team increased their margin. Baclao had his conference best with 10 points for 5 out of 5 or 100% field goal percentage that automatically gave him the Best Player of the Game award. Alaska’s lead had ballooned to 19 points on the two-minute warning of the game ball. Coach Tim Cone, raised the white flag by taking out Marqus Blakely. The Aces will savor a 2 game lead and can try to oust the Hotshots and close the series on Sunday July 5, 2015.